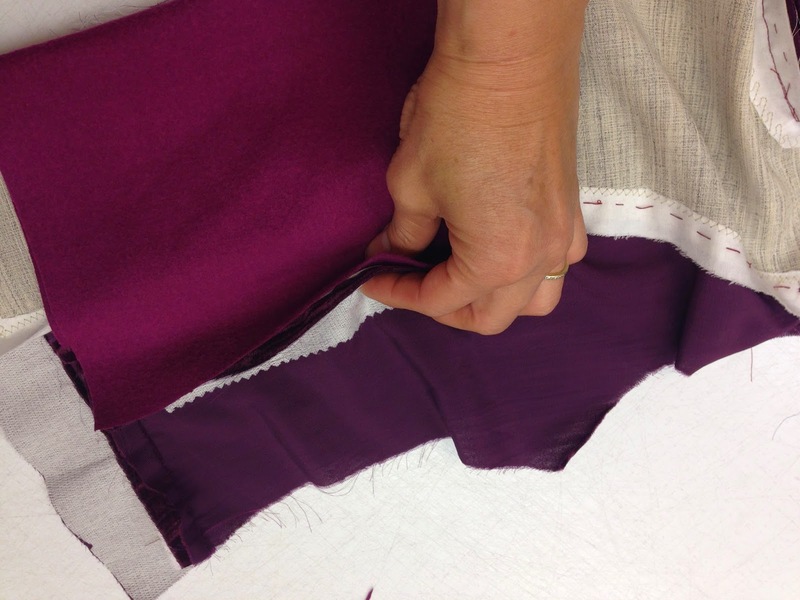 Making muslins for fitting is not something I like to do. 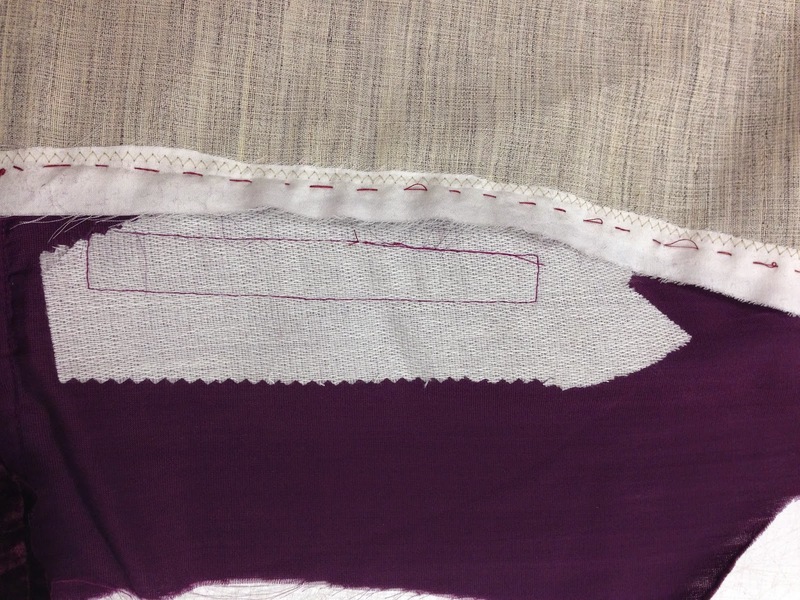 So whenever I can, I try to make sure that something can be done with the muslin. However, when the pattern is asymmetrical or a bit confusing, it is really necessary to bite the bullet and just do it. 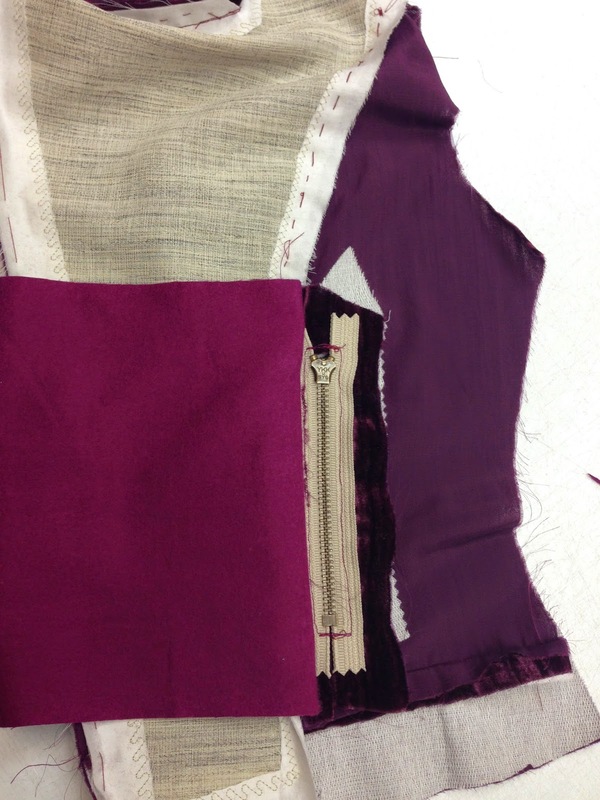 When I started making my Moto Jacket, I made muslins in two sizes, wadded them up and threw them in a corner. 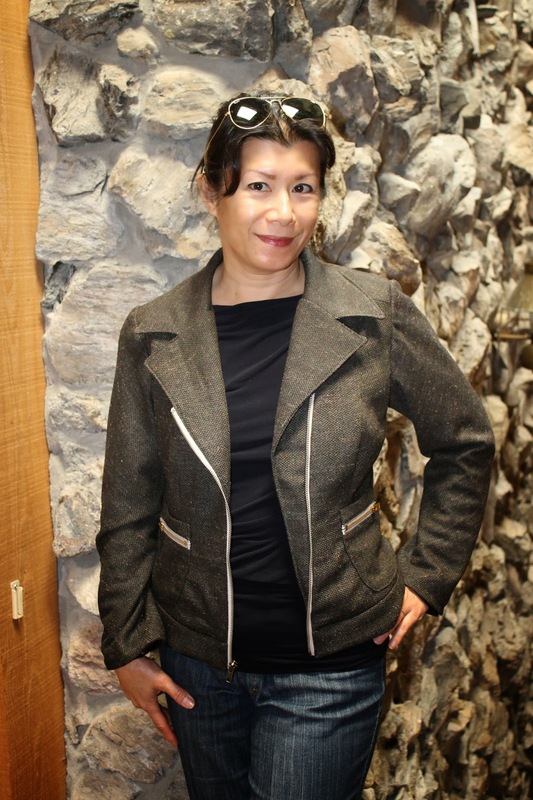 Turns out, of course, my Marie admired my finished jacket and expressed a desire to have me make her one too. I pulled the size 8 out and tried it on her. Except for a few inches pinned out of the chest, it fit perfectly! There's double-duty out of one muslin. So I ransacked my stash(es), trying to think of what fabric would a pre-teen find not boring. 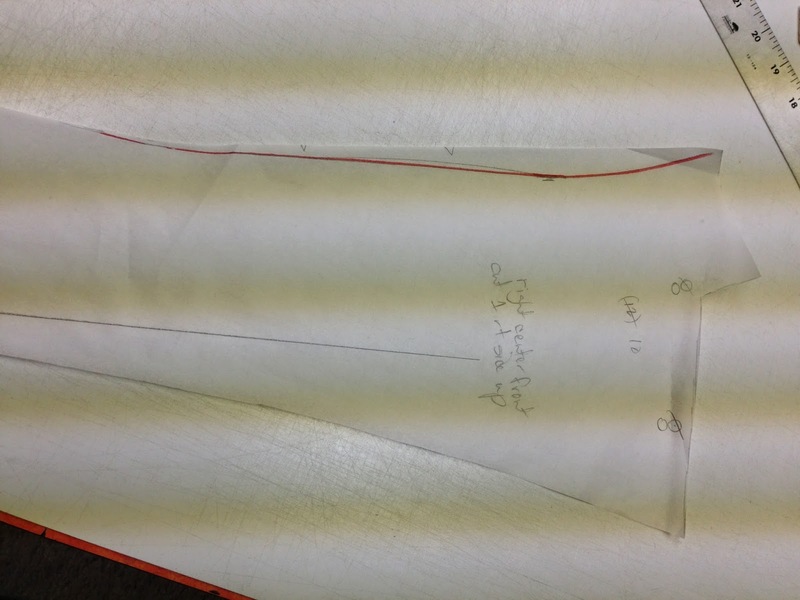 And re-read the fabric possibilities on the pattern envelope. "Velvet", it said. Really? 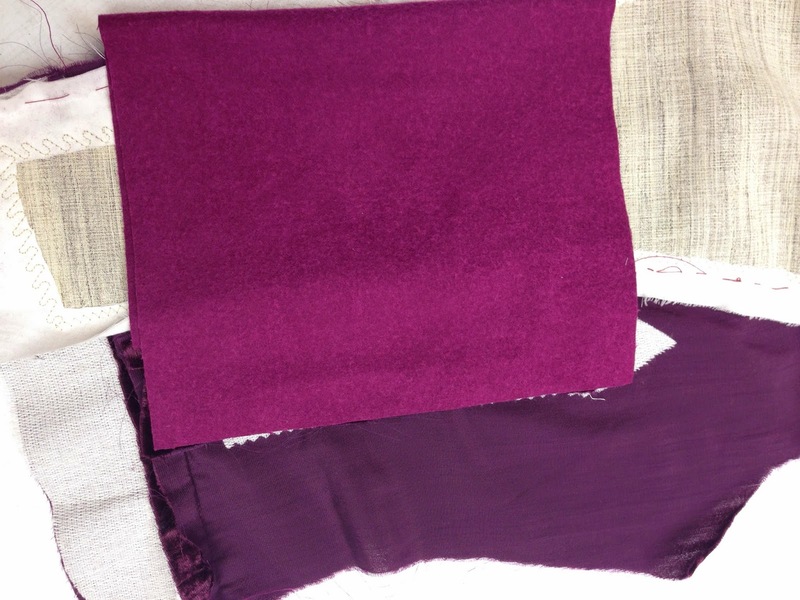 Well, this was the velvet that I had, purchased to make a long skirt for Christmas, but didn't have time to. 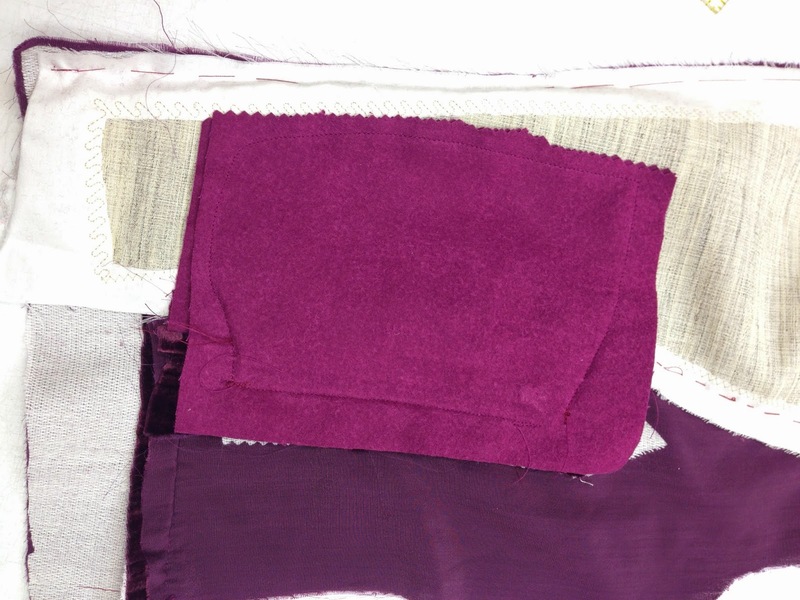 It is a panné velvet, I believe out of some kind of synthetic. No problem, I thought. But oh my, I forgot velvet can't be pressed well. 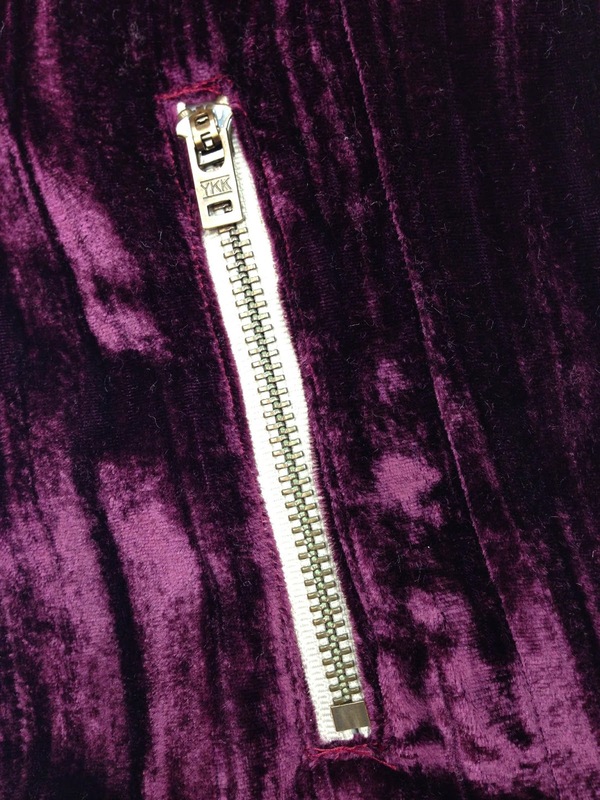 Luckily this is a kind of already distressed velvet. I agonized in my dreams about whether to fuse or not to fuse this fabric. 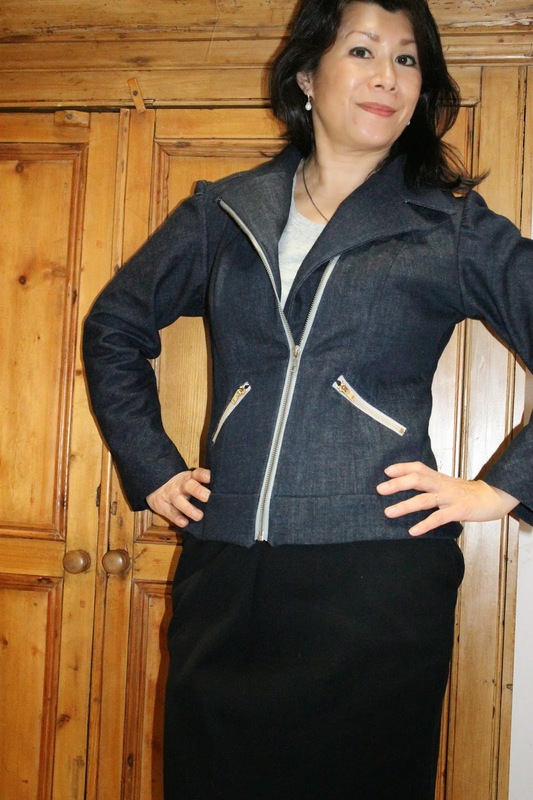 I decided to use hair canvas in the fronts as well as the yoke to add body to the jacket. The velvet seemed a bit soft for a jacket. And lining it would help. 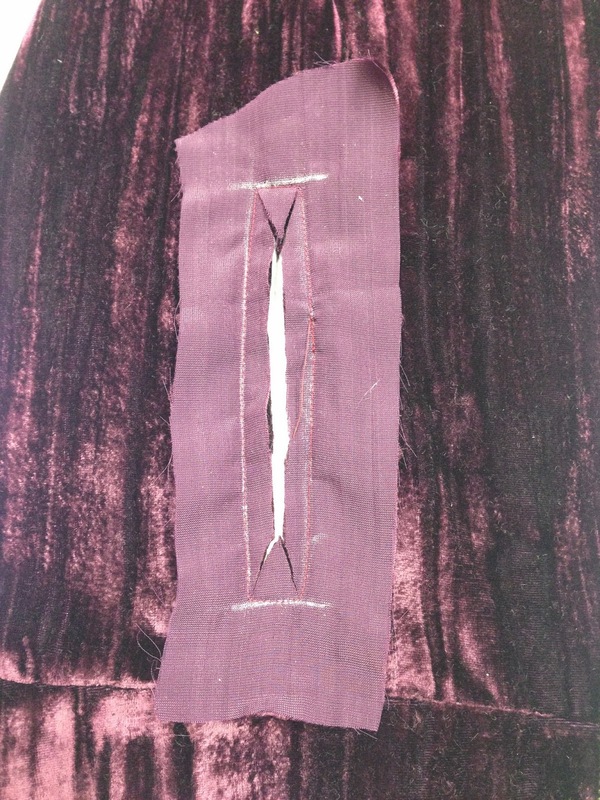 Then I decided to go ahead and fuse interfacing to the front facings, using a towel facing the velvet side. 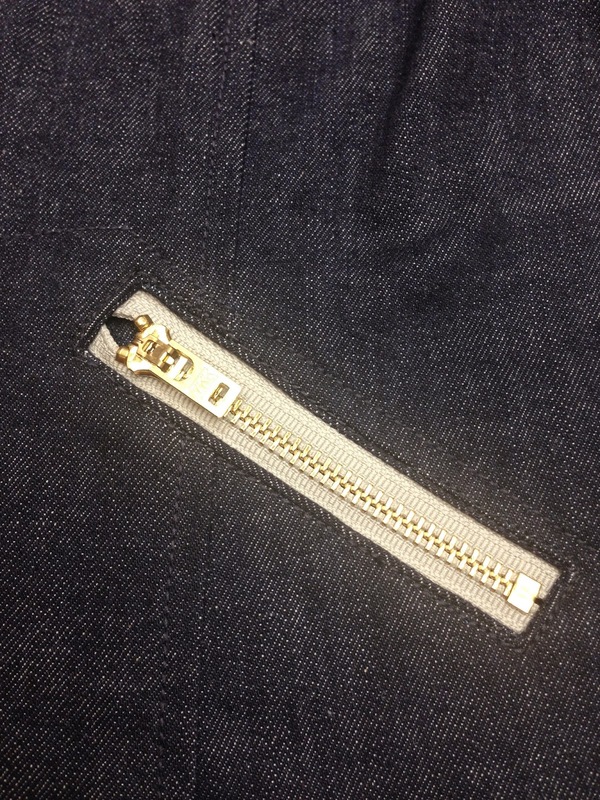 Here are some photos showing the steps to making the zipper pocket. This is how I mark the top of the sleeve cap with chalk. Easier than seeing a notch which gets lost when you gather ease. 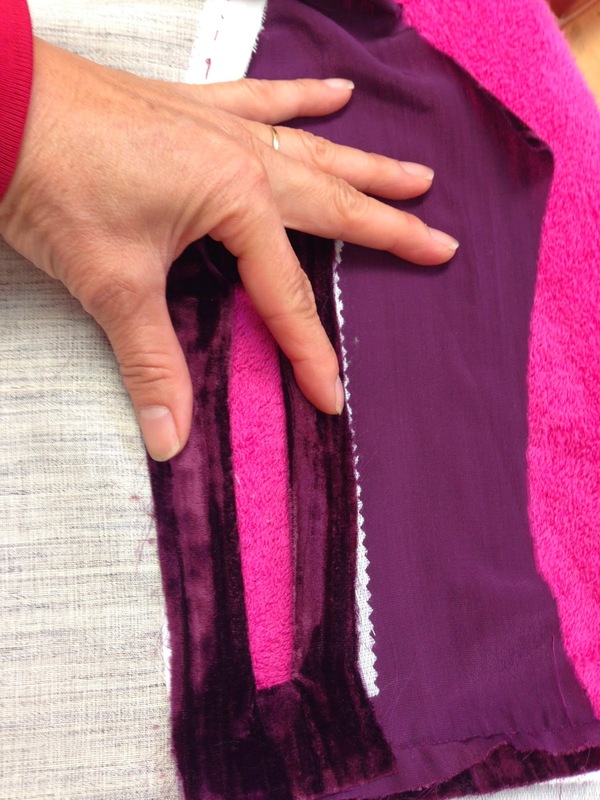 I cut the sleeves on the straight grain, rather than on the bias which the pattern says to do, because of the obvious "stripes" on the velvet. I am happy to see that they turned out well. 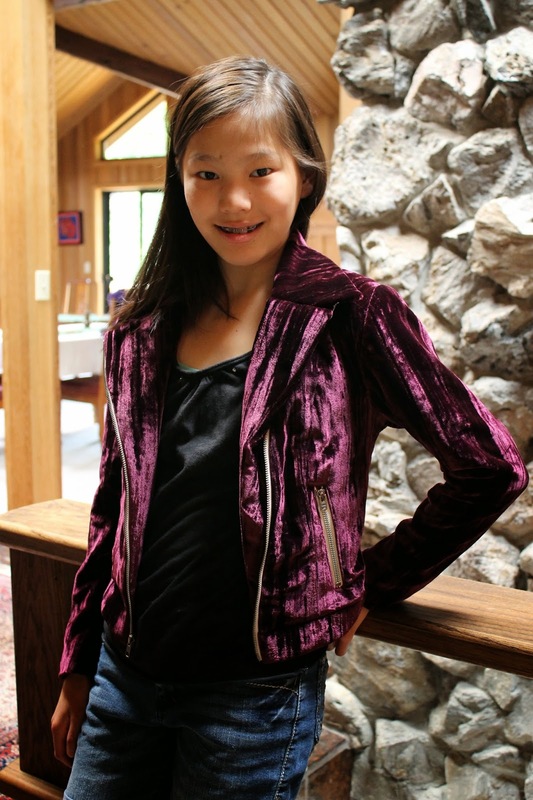 And now I'm the one who wishes she could borrow THIS jacket!! 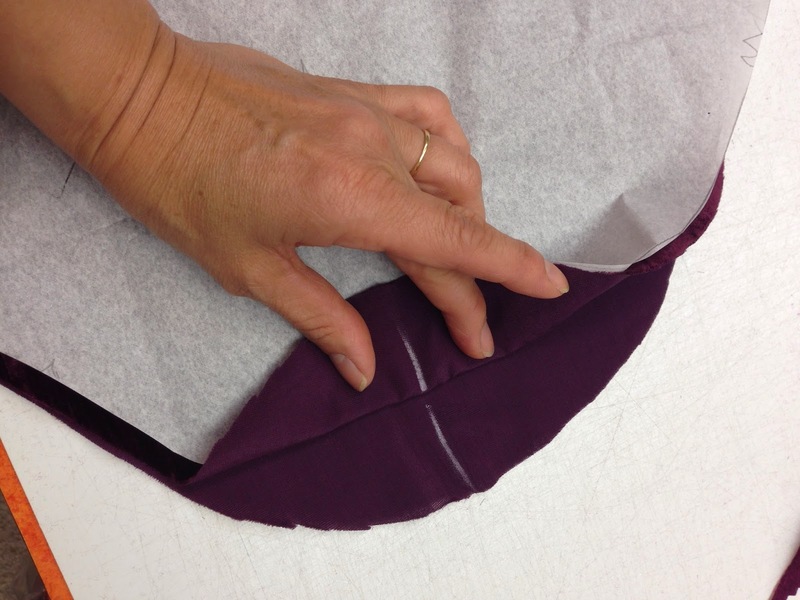 Lining out of hammered satin feels very nice! 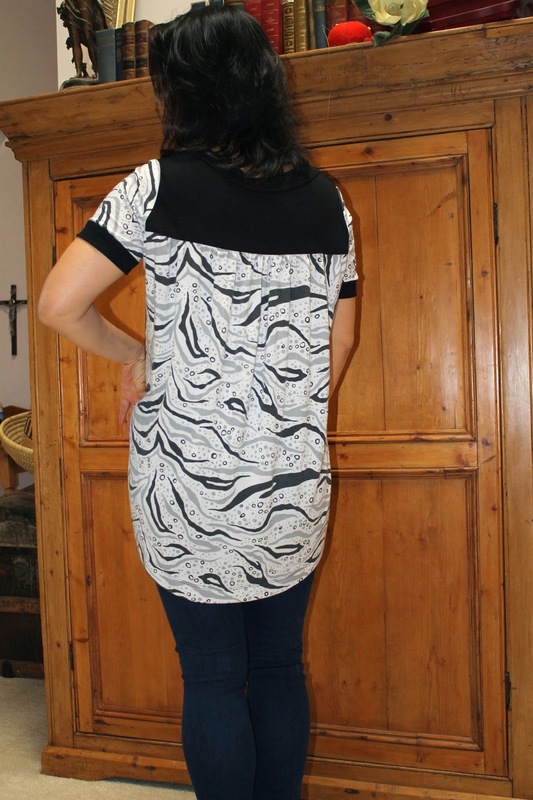 This is my first Blouse-back T by HotPatterns, a wearable muslin in rayon and rayon-lycra fabrics. 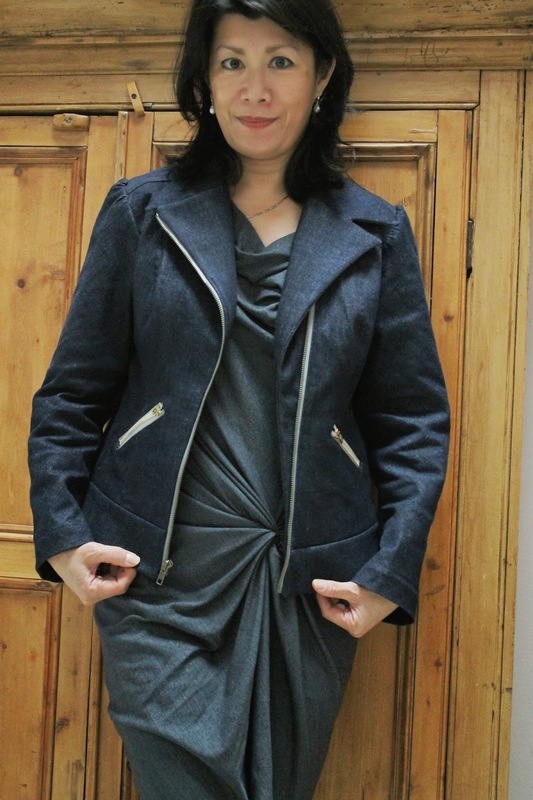 I used a size 8, though my measurements are size 10, because I have narrow shoulders and this pattern doesn't have a close fit in the waist or hips. 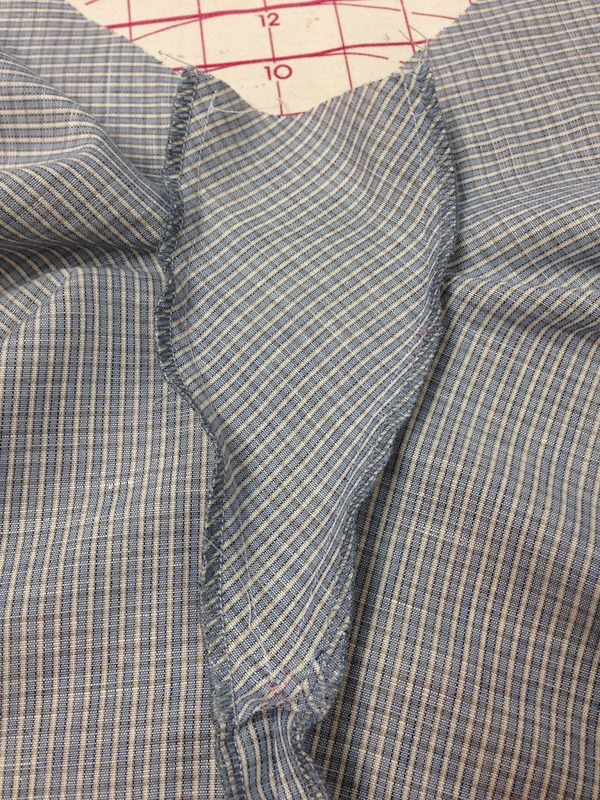 I compared the front pattern piece to my blouse sloper, and found that I should take some area out of the middle. (I usually do a small-bust-adjustment.) 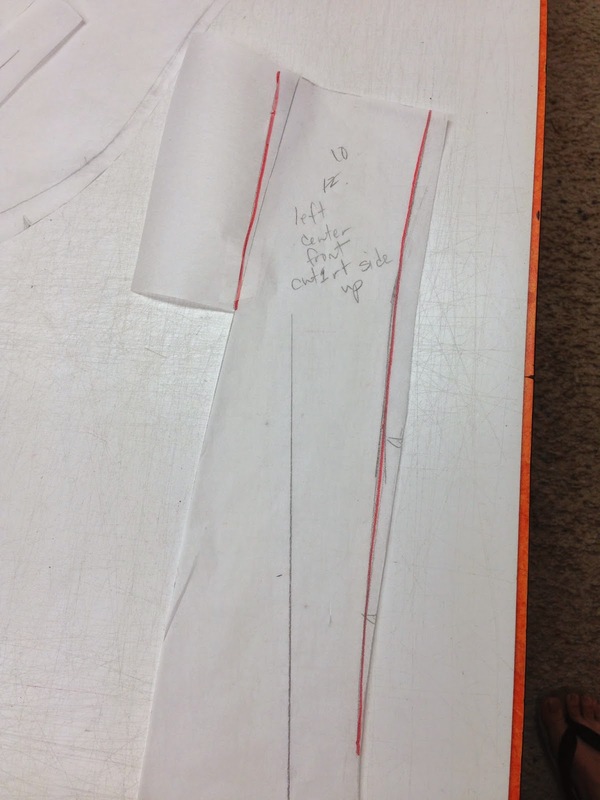 So I took 5/8" out of the middle of the front piece before I cut the fabric (which is 2x that). 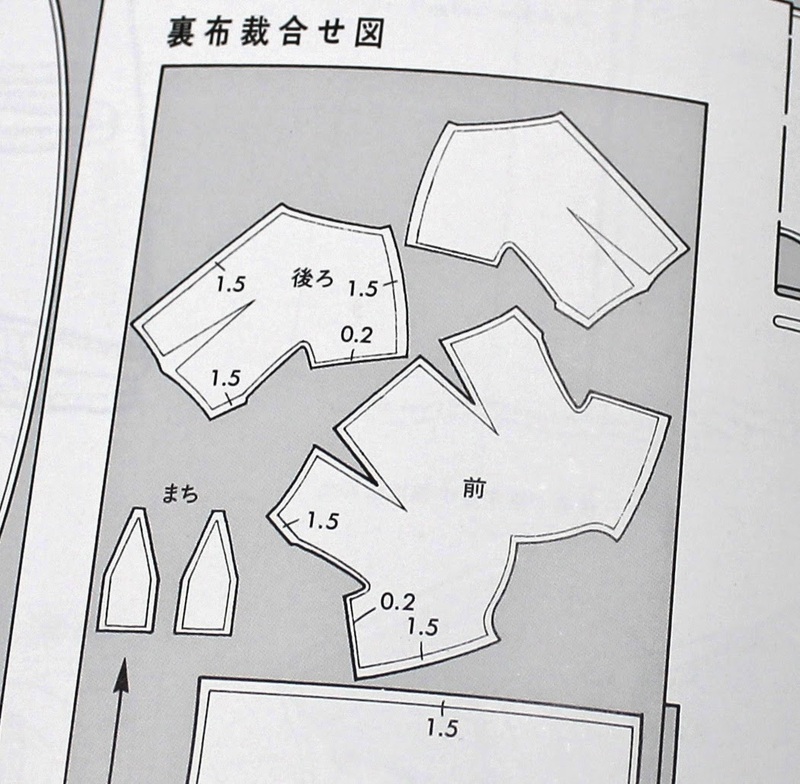 The neckline looks much higher than the pattern illustration. That is probably due to 2 things: I cut a smaller size than my measurements/my hack alteration, and the back is pulling up the front. No problem--I like the neckline where it is for this shirt, but will probably cut it 1.5 inches lower on the next version. 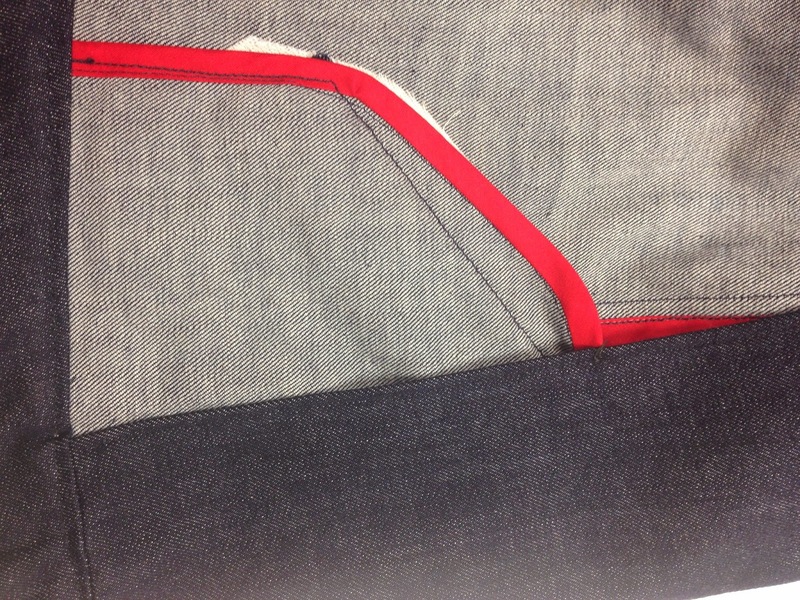 It looks like the side seam is also pulling to the front here. That is because the weight of the back is pulling down. The rayon with lycra is a heavier fabric, but the front is cut out of a double layer because of the transparency of the black rayon. 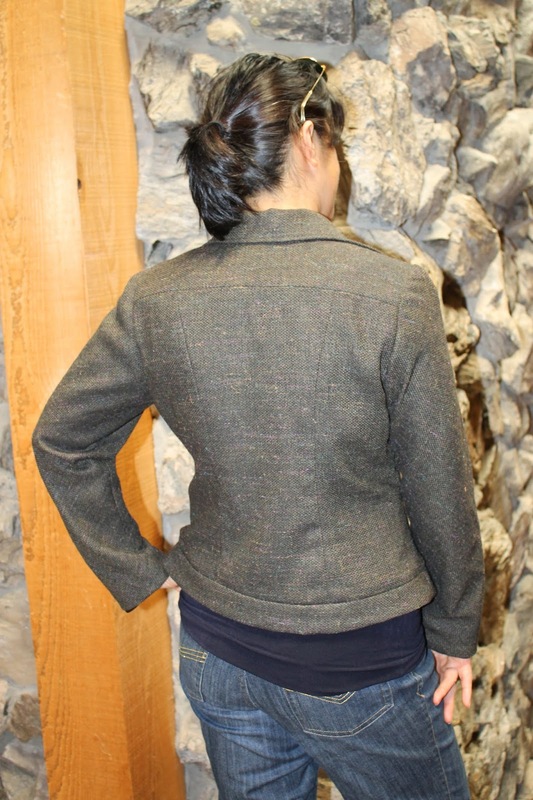 That could also be why that back looks very long in the next photo. 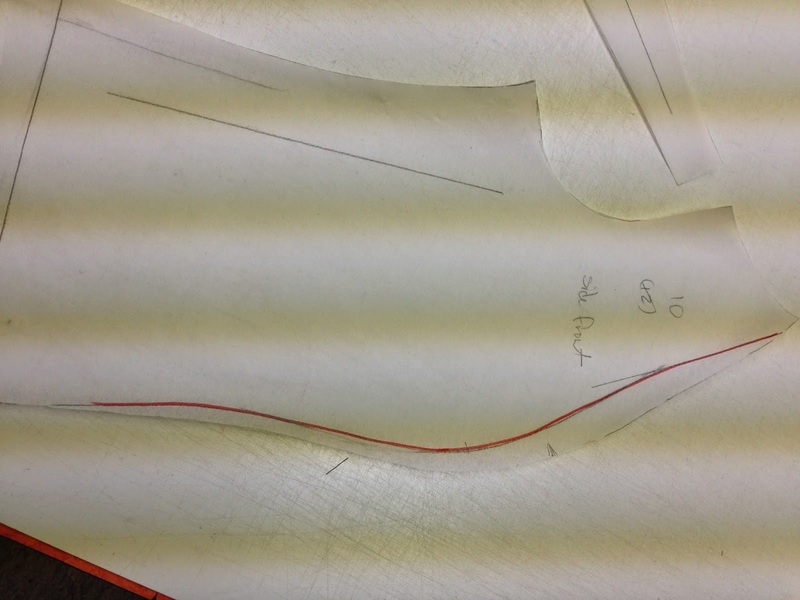 I am not concerned about the side seam, as I like the effect of part of the back fabric being visible from the front. I also doubled the yoke piece, in order to give better support to the gathers, and to enclose the gathers on the inside. 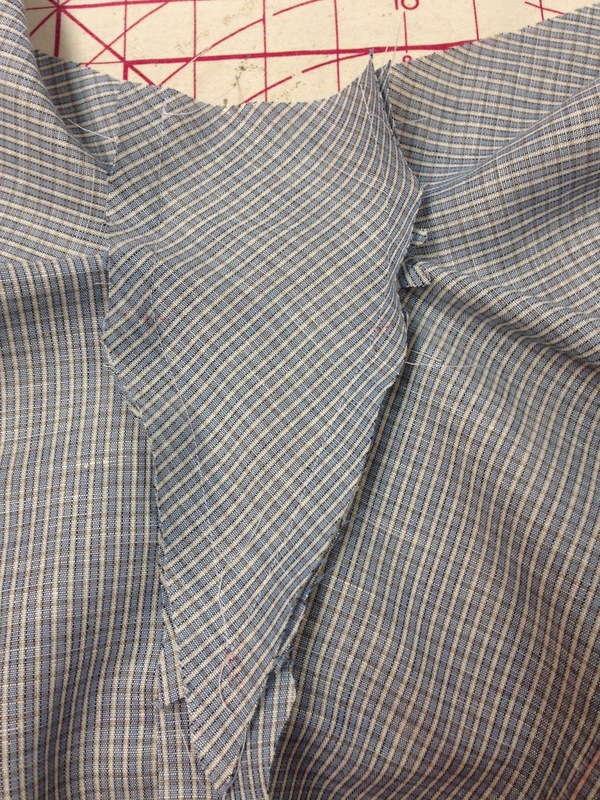 I'll be shortening the back hem by about 4 inches next time. It is very, very comfortable. The sleeves are nicely drafted. The versatility of color contrast. 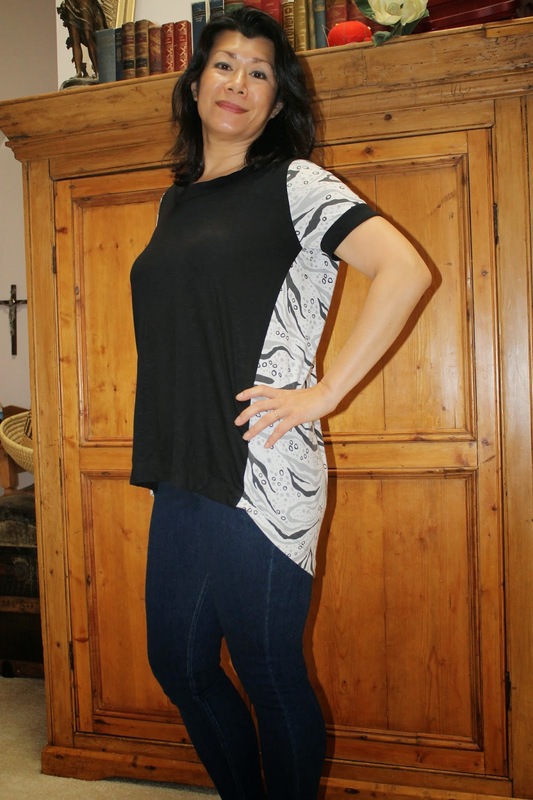 It is on-trend but easy and flattering. If I gain 10 pounds I can still wear this shirt. Expect more of these to come! 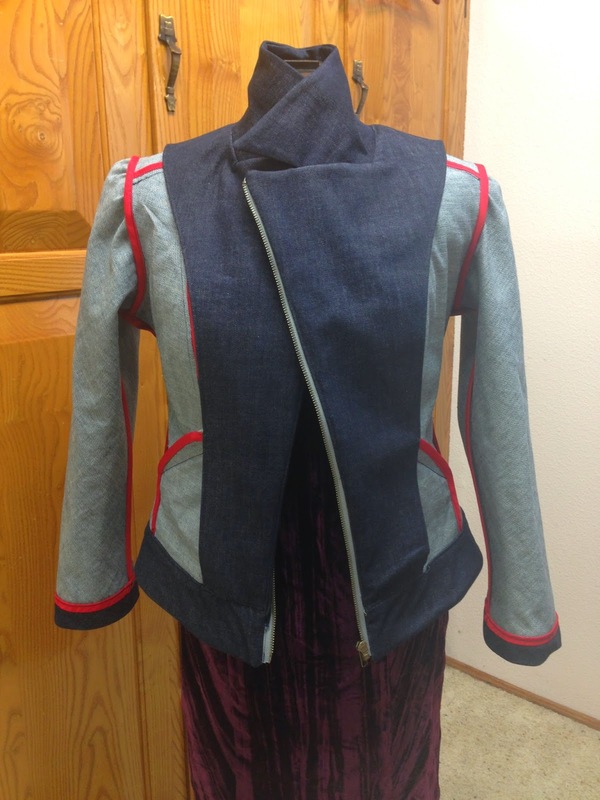 I think I am developing an obsession with this HotPatterns Denim Diva Biker Babe jacket. 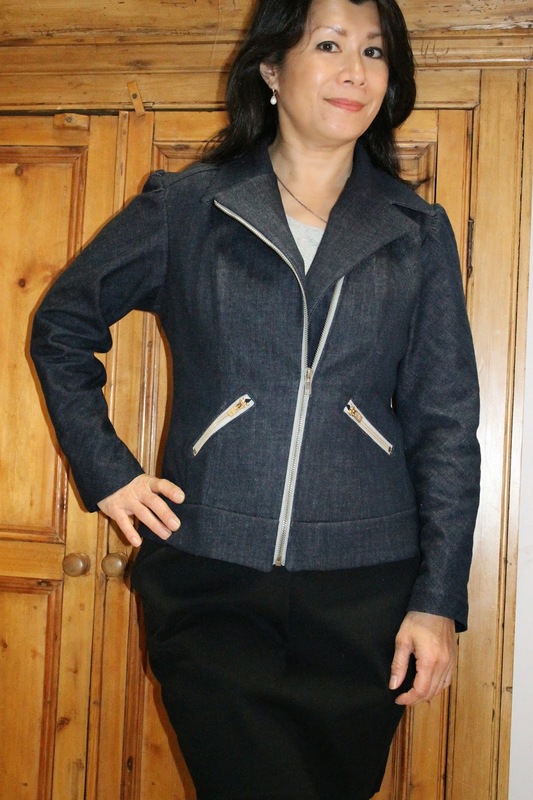 First I made a wool tweed version and now, here is my denim version. 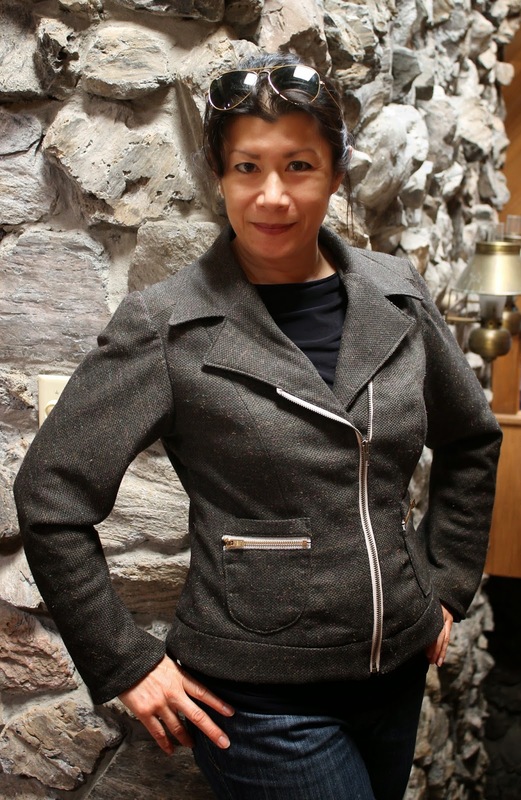 I love that there is a yoke and a full collar on this jacket, and that it can be zipped all the way up if you needed to keep the wind from getting at your neck. 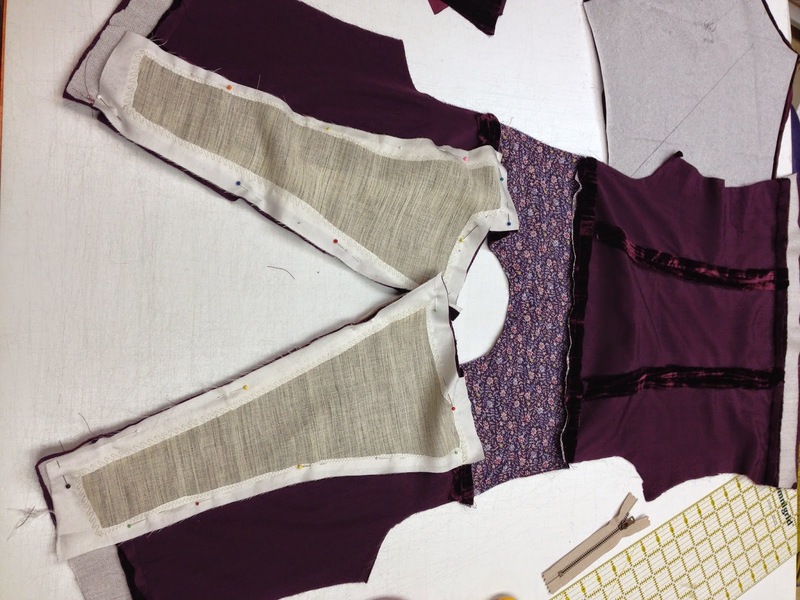 I've altered my pattern so that I have a very nice comfortable fit. This jacket goes with everything from shorts to dresses. It can be either casual or a bit dressy. This version is not lined, but bound with contrast binding. 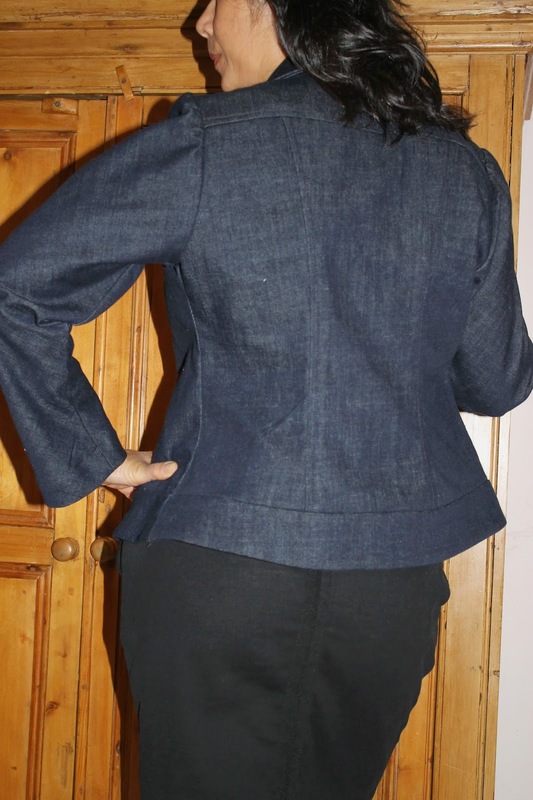 A tutorial for how to apply the binding (this is where I got my inspiration for doing it to this jacket) is here given by HotPatterns, although it is a different jacket. 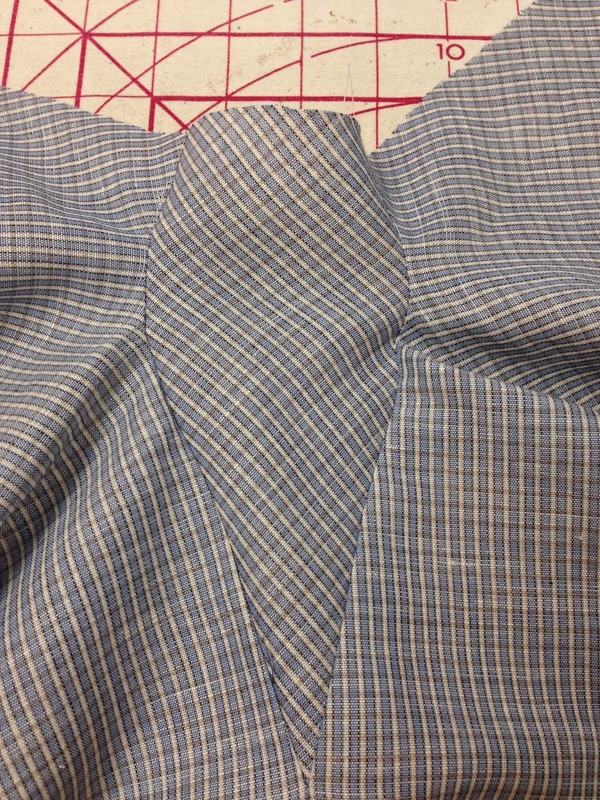 Since I planned to topstitch most of my seams, I applied the binding to both edges of the seam allowances together. 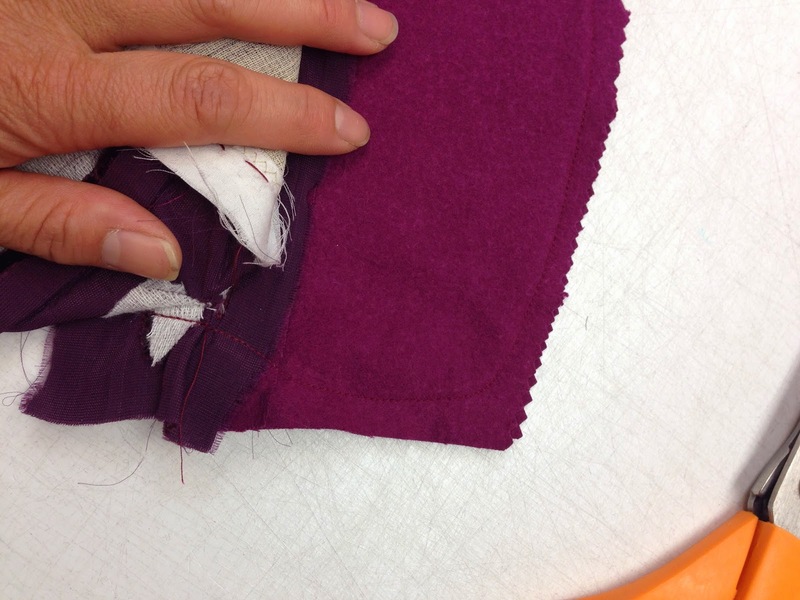 That means only half the work of binding for the seams. 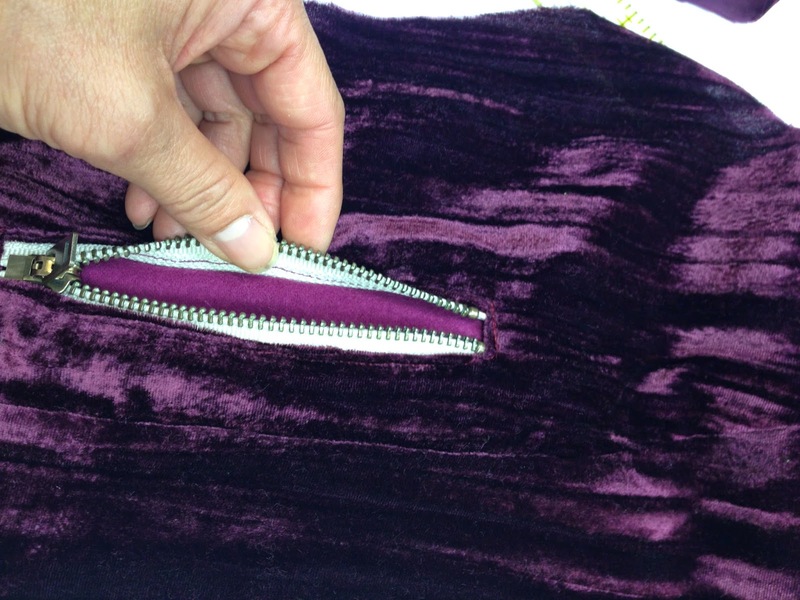 I used purchased seam binding because I found out it is very inexpensive through WAWAK. 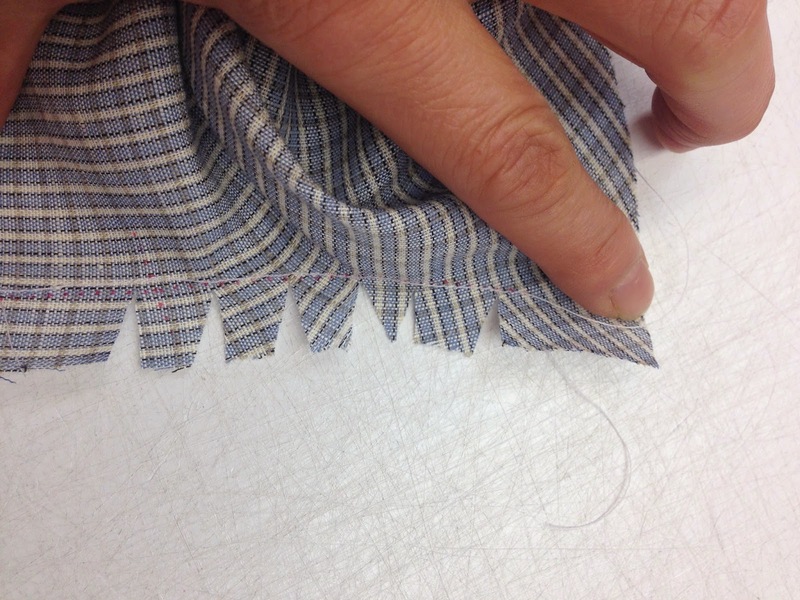 They call it bias tape hem facing, and I used 7/8". 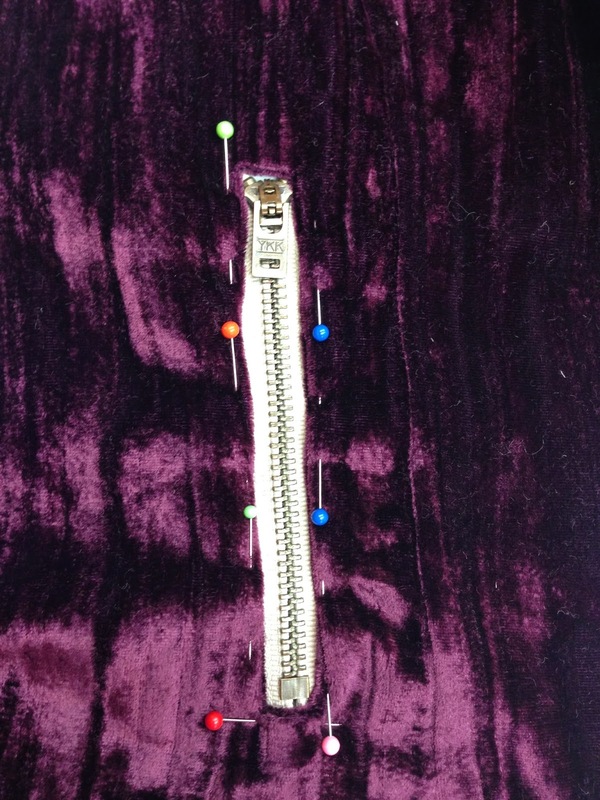 For the pockets, I made a window to topstitch the zipper into, then sewed a patch to the inside of the jacket behind the zipper. Actually the right side of the above photo is "up". I suppose I could have shaved more area off the top of the sleeve in order to make it ease in better. You are perhaps wondering if the tucks are supposed to be gathers. I eased it in the best I could but decided to leave the fullness in this way. I am not sure if it has to do with the bias cut. 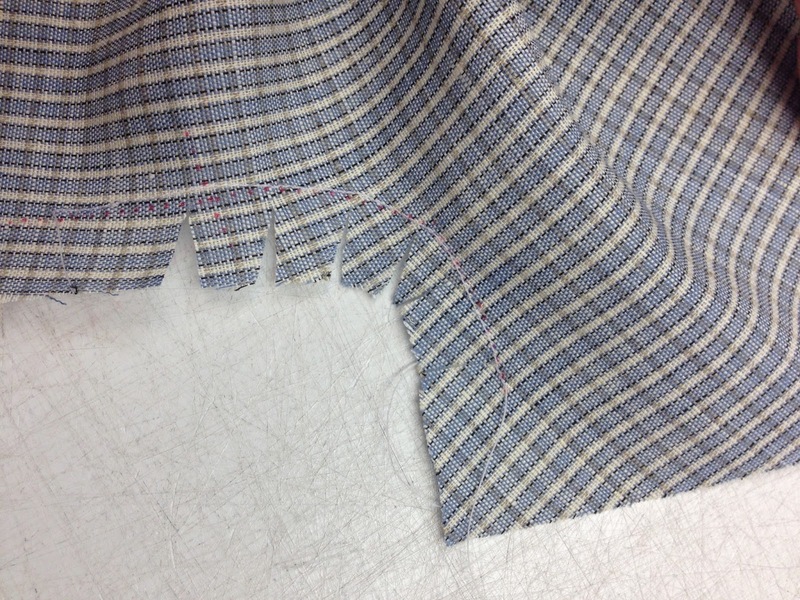 I extended the width of the hem bands by 5/8" from what the pattern was. 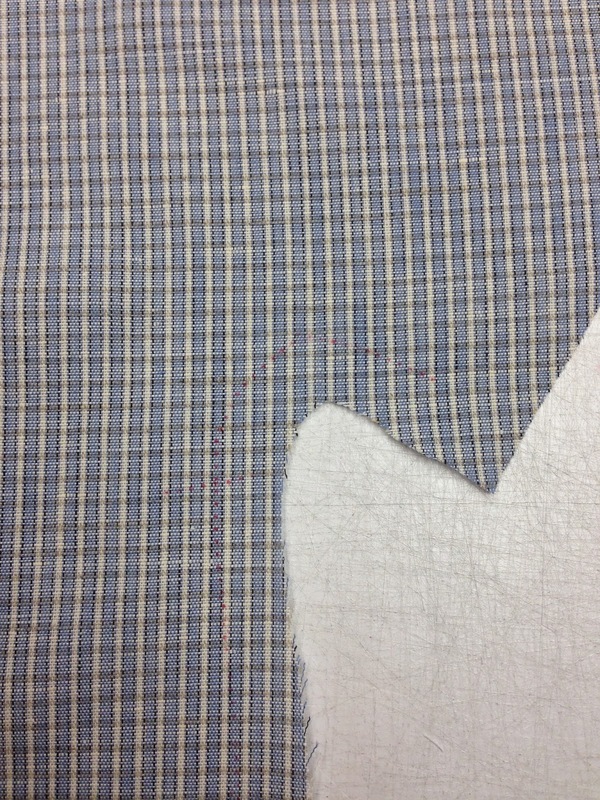 When sewing the points of the collars, I took 2 stitches diagonally before turning the corner. PatternReview.com was holding a contest for Colette pattern reviewers in the month of April, in order to promote indie pattern designers. 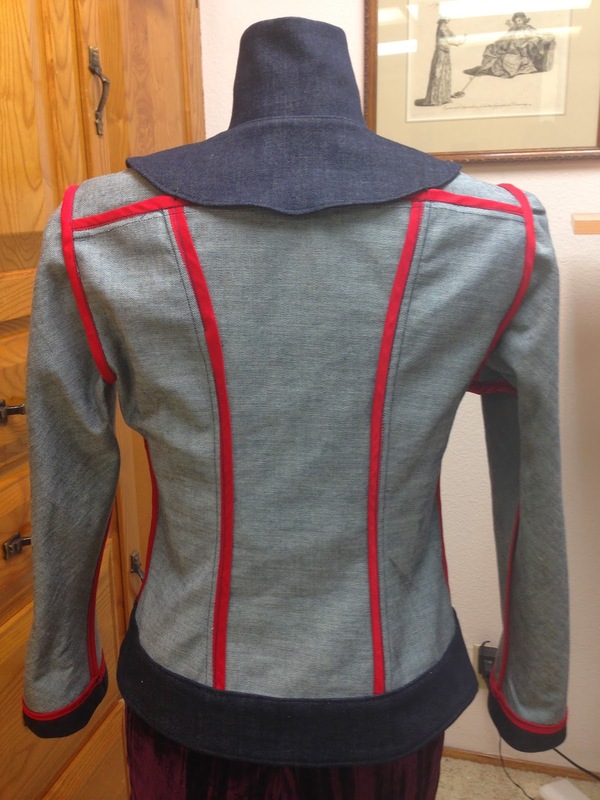 It doesn't take much to motivate me to sew and show, so I submitted two reviews of Colette patterns. And much to my surprise, I received this email. Congratulations! You have won the random entry prize in the Colette Patterns April Indie Contest! You have won a pattern bundle with two new Colette Patterns AND an e-Book! Colette Patterns will be in touch with you shortly regarding your prize. Thank you for entering this contest, inspiring others and sharing your project with us! Please let us know if you have any questions at support@patternreview.com. Well, how about that?!! I am thoroughly pleased. And as the prize, I actually had a choice between the e-book and the printed book, so I chose the printed book. Since Colette Patterns is just up the freeway in Portland, the goods came quickly--the two newest patterns and the new book, The Colette Guide to Sewing Knits. The book contains very basic information, but it also has some good tips and ideas. 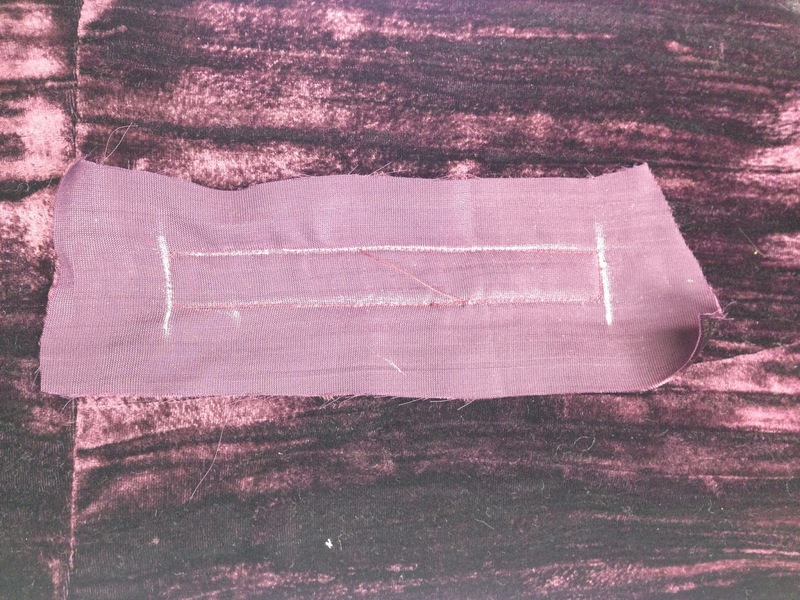 Some of what I found helpful to me is info on the coverstitch machine, and ideas for applying elastics and trims. It is actually written by Alyson Clair, who says in the book, "Knits can be an entirely new game, but it's the only one I want to play." I agree. 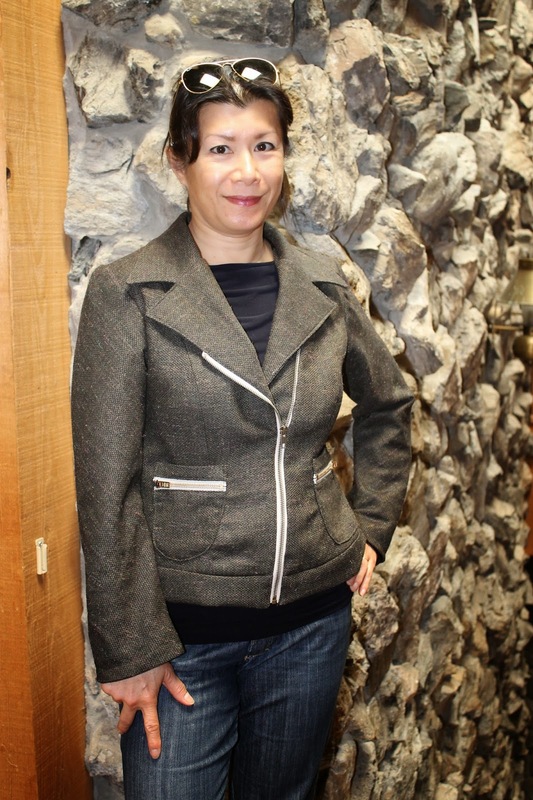 I have made plenty of tops and dresses out of both wovens and knits, but more often than not, it's something made of knit that I pull out to wear. I've also noticed that out of the clothes I make for my daughters, the garments made of knit fabric are definitely used quite a lot. The contest format was a random drawing, and my review for the Colette Licorice dress is the one that won.